Linda Rawson, President, and CEO of DynaGrace Enterprises – an 8(a), WOSB, Information Technology and writing services company, has launched a Kickstarter Campaign. 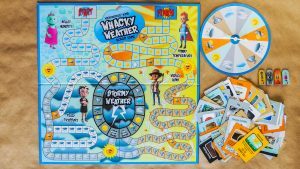 The Science, Technology, Engineering and Mathematics (STEM) board game is titled WeatherEgg Kids: Whacky Weather Board Game. The board game will help raise funds for her invention, called Weatheregg™ and teach children about weather. Linda was born in a small farming community in Utah. She was raised by her mother, who was a single mom raising five children. Her mother never went to college and did not have any dreams of owning her own business. Because of this, Linda thinks it is essential for children, especially girl children, to acquire more knowledge and skills in STEM. With the onset of STEM (Science, Technology, Engineering, and Mathematics) curriculum in education, science needs to be fun. The WeatherEgg™ kids, animated 3D humanoid characters, make weather science fun. Sweet, loveable, Holley Humidity, moody Peggy Pressure, mischievous Wesley Wind, and the hero Tommy Temperature can cause quite a storm. The WeatherEgg Kids will appear in a mobile application and a web application to teach children about weather. DynaGrace Enterprises hopes to lead the field in teaching children about the weather. DynaGrace Enterprises continues to support a path of growth while maintaining a reputation as a provider of Information Technology and writing services. Customers can learn more about DynaGrace Enterprises by visiting the company’s website at DynaGrace.com or by calling the company directly at 800-676-0058. Please learn more about WeatherEgg by visiting WeatherEgg.com.